In the preceding chapters, I have mentioned several times of sin and the need that it presents in our lives. We have seen that sin requires justice and therefore punishment. However, sometimes we can’t see our sin clearly. I have often found myself hiding in this fog, unable or unwilling to see my own sin. I have lived many years not seeing the depth of sin within myself. It’s hard to look at. I didn’t want to see the sin or the bad inside myself or others. We don’t want to see ourselves like that. We try to hide it, suppress it, and control it. We don’t want to admit that we have set ourselves up as the standard, the center of our universe. We can be blinded to our own shortcomings. What aspect of your life do you need to examine for shortcomings? I know for me, I walked many years knowing that God died for my sins and accepting His forgiveness, but failing to see how much sin I really had. As I mentioned before, I had applied Genesis 6:9 to myself. Noah is called “blameless in his generation.” Compared to whom? His generation, those around him. So, as I continued to compare myself and my actions to this generation, I didn’t seem so bad. I knew I made mistakes but compared to the world around me I felt upstanding. I didn’t see the depth of my sin. Who are you tempted to compare yourself to? My time after college was the point in my life where I was most blinded from my sin. God used a class at church to help me begin to understand this separation between my actions and a holy God. The class was going through The Gospel Centered Life by Will Walker and Bob Thune. 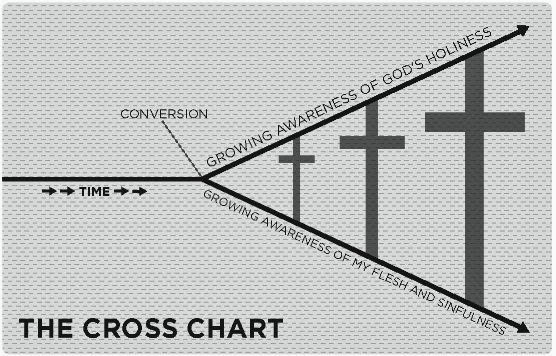 One of the main things that is repeated in the book is a graph that shows our growing awareness of God’s Holiness and equally growing understanding of our own sinfulness. The lines diverge at a 45-degree angle from one another and leave a huge gap separating us. The beautiful picture is that Jesus’ cross is what fills the gap. The cross is the only thing that bridges our sinfulness to our holy, righteous God. I find this picture amazing. It was looking at this chart from class that I asked God to show me the depths of my sinfulness. I realized that without having an accurate picture of my sin, I could not see the miraculous work that God has done for and in me. It started with a shock to my system. Would you be willing to ask God to show you where you need to change? Just before this realization of my own sinfulness hit, I found myself very tired of the generalities of motherhood. I was telling the kids things over and over yet they weren’t listening or obeying. This lack of progress in my children’s lives added to the lack of purpose I was feeling. Everything was being repeated, from my requests and instructions to my daily tasks. I was in a cycle that repeated day after day and sometimes moment after moment that seemed without progress. All my efforts were being poured into trying to be a good mom and trying to see results in my kids but was met with the feelings of failure. I felt like my actions were meaningless. I was so weary of their disobedience, so tired of the repetition. My actions seemed to fall unseen, unheard and unimportant. I had been reading in Isaiah (1:13-14) and it talked of how God was weary of the iniquity and vain offerings. While standing in my frustration and anger at my children and their lack of obedience, it clicked. I saw myself as a child who wearies my Father. I saw that I was setting myself as the standard and judging others in comparison to my actions. I had to learn it is not about me. I constantly miss the mark by looking to myself and my own desires. I fail to see the needs of others. In my selfishness, I seek myself and not God. This selfishness pours out in anger and ugly actions. I seek my agenda of getting things done quickly and I seek my desired outcome. Maybe I just want my children to eat the meal in front of them or put on shoes to get to school, but I often went straight to anger when I didn’t get my way. Wanting these things from my children is not wrong but trying to achieve them with my anger was. I started to see my reaction was selfishness when I didn’t get my own way or didn’t feel heard. I started to identify with being on the other side of the weariness. Before this moment, I had so often seen myself in the authority role as a parent. I had lost sight of my position to God. I was only viewing my authority from God and lacking in realization that I was under God’s authority and not my own. I was standing on my own pride. I pushed and was unyielding when I didn’t get my way. I was not slow to speak and quick to listen (James 1:19). I was not open to reason (James 3:17). I was demanding and angry. I asserted my authority as the parent and I couldn’t see or let others see that I don’t have it all together. In fact, I was fooling myself to think that I could in any way, shape or form have it together. With this new realization, my picture and comparison of myself to Noah began to break down. My “I’m not that bad of a person” was faced fully with the question compared to whom? At this time, I realized that I had been choosing the wrong comparison. I could not see an accurate picture of my need for forgiveness without comparing my actions to God and not the world around me. Do you see your sin? Do you look at it and admit it? Do you find yourself minimizing and sweeping away each act as just a little mistake or try to justify your actions saying it wasn’t that bad? Wow! That first hit me realizing that I was sitting there angry with little children because they didn’t meet up to my standards. I have a vivid memory standing in the hallway where verses were flooding my memory. As scripture swirled about my mind, conviction came into my heart. I felt as if God was showing me, in my strength I wearied Him. In my self-righteousness and pride I wearied Him. I am not the standard! God’s measurement is not me versus those around me. He doesn’t weigh my wrongs versus the people on the news. His standard is Himself. He is the creator, life giver, King enthroned in heaven, the very Lamb of God without blemish. He is the standard. He is the benchmark that I could never reach. I began to see my pride. I began to see my anger for what it was, sin! The line of my sin on my graph took a steep turn downward. The realization of the gap and need for a Savior was growing. No sin is too small that it doesn’t need forgiving and no sin is too big that it won’t be forgiven. No matter the sin, we stand on equal ground needing forgiveness to correct the relationship. We are all sinners. It is hard to admit but when we look to Yahweh, The I AM, when we get a glimpse of all He is, we see what we are not. We are not self-existent, we are not the givers of life. We are not the ones who hold it all together. Instead we are the ones that tear it apart, we break peace and harmony when we selfishly fight with one another. We don’t know others the way we are known, and so we focus on and think of ourselves and our own dreams and ambitions. We live for ourselves. I am a sinner! Look at my typical day… I don’t remember to praise God for my day. I lose patience with my kids and yell. I complain. I make excuses for my lack of patience. I forget to answer in gentle love. I get angry that I cannot control my kids, my life. I waste time with trivial things. I act selfish. I try to justify my actions to myself and others. I do things for my glory and power and not for the Lord’s. I procrastinate. I compare myself to others. Some of these things you may look at and think, “well everyone does that – that is just being human.” That action of justifying our actions is the very point. The standard is God and being merely human, we all fall short. Thankfully for us that is not the end of the story. However, we first need to hear and be reminded this truth of where we start. If we go alone we are left falling short, but like Moses, we don’t have to go alone. We were given the opportunity to receive Him and believe in His name, to be children of God (John 1:12). If we are children of God then we do not go alone but with our Father. Is it that we don’t have many sins or that we just fail to see them? I pray that we see our sin so that we can see the abundant grace in the forgiveness of Jesus. If we are known, why must we confess? Kevin Flannery, Pastor at Church of the Saviour, puts it this way in a sermon from 1 John 1, “Confessing is agreeing with God that our sin is wrong.” Will we run from him? Will we fight against His truth? Or will we run to His open arms of forgiveness and agree that we need Him? He is so faithful! If we confess we will be forgiven! We will find ourselves under His grace. The implications of this verse are amazing. God, Yahweh, does not deal with us according to our sin but according to His love. The I AM has separated our sin from us “as far as the east is from the west.” (Ps 103:12) What a loving, faithful and gracious God! He is merciful and slow to become angry. Each selfish act, each angry word, and every sin is in need of forgiveness. If we confess- if we bring our sin before Him and agree with God that we have acted wrong than He is faithful and just and will forgive us (1 John 1:9). God does not deal with us according to our sin but instead according to His love (Ps 103:10). We don’t need to try and hide our sin or try to earn our standing because He already knows us and extends salvation and forgiveness to us. This brings value because the I AM, the faithful and just one separates our sin from us as far as the east is from the west. When we are searching for significance and identity, our confidence is found in God. We don’t have to prove our value. We can rest our value on Yahweh’s forgiveness. Because He is merciful and gracious our sin can no longer define us. If we are to let forgiveness affect our lives, we would be transparent. Showing others our faults is to show them how much we have been forgiven. We would not put up a false picture that we have it all together. We would choose confession to those around us by taking responsibility for our mistakes and failures. If we would let how much we were forgiven affect our lives it would change us. We would forgive each hurt that is caused by others because we would know the depth and volume that we have been forgiven by God. Merciful God, help us to clearly see our sin. Give us strength to confess and admit our need for forgiveness. Show us how we fall short so that gratefulness and love may abound. Thank you that we are known and can be forgiven. Our sin is not a surprise to You. We praise you that “If we confess our sins, [you are] faithful and just to forgive us our sins and to cleanse us from all unrighteousness” (1 John 1:9). Teach us to come to you with a repentant heart and enable us to extend your forgiveness to others. May our hearts be set on you. Help us see that our value is in You because You go with us. Thank you that we can be am forgiven. In Jesus’ name, we pray. Amen.